Children should visit the dentist by their first birthday. 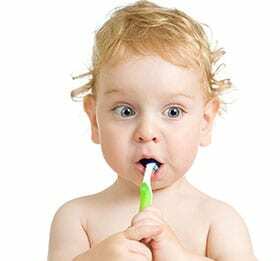 It is important that your child’s newly-erupted teeth (erupting at six and 12 months of age) receive proper dental care and benefit from proper oral hygiene habits right from the beginning. Getting to know your teeth is fun! Even before your baby’s first tooth appears, the gums can benefit from your careful attention. After breast or bottle feeding, wrap one finger with a clean, damp washcloth or piece of gauze and gently rub it across your baby’s gum tissue. This practice both clears your little one’s mouth of any fragments of food and begins the process for building good daily oral care habits. Just because your child’s primary teeth, often known as “baby teeth,” eventually fall out, that doesn’t mean they’re not important. Primary teeth play an important role in your child’s overall health, development, and well-being. Much like your own permanent teeth, your child’s primary teeth require professional and at-home dental care. Decay can happen at any age, so it’s time to visit the dentist within six months of the appearance of your child’s first tooth, and certainly by age one. In addition to checking for tooth decay and other pediatric dental problems, your dentist will show you the best ways to start your child on a lifetime of good oral health habits. What Happens if Baby Teeth are Not Cared For? If a tooth becomes infected and needs to be extracted, the dentist will recommend inserting a space maintainer. If the space is not preserved, other teeth may drift, causing difficult-to-treat crowding and orthodontic problems when permanent teeth come in. The most important aspect of taking care of your child’s primary teeth is the example you help to set. Early on, your child should develop the habit of brushing and flossing that will carry into adulthood. Healthy teeth also lead to easier dental visits, which teach your child there is nothing to be afraid of at the dentist.